After about a year of the Gaming App of the Week, I've been very hard on games that are nakedly derivative of existing hits. Then one comes along and literally does everything a previous success did, except upside down, and I feel like I have to tip my hat. That's Sea Stars. This game is an inverted Jetpack Joyride. Halfbrick's hit from the summer had you flying an endless route through a cartoon research lab, avoiding hazards by tapping the screen to elevate, In Sea Stars, by Hothead Games, you're a dolphin making an endless run through the ocean, tapping the screen to dive. Tap, hold, and release, and your dolphin will plunge to the bottom of the screen, then shoot to the surface and jump. Jellyfish are the fatal obstacles, mimicking the electrical traps in Jetpack Joyride. While it is an obvious copy, albeit stood-on-its-head, Sea Stars is not without merit, and does present a reasonable challenge that's worth several restarts, even more for those not aware of the game's origins elsewhere. It's a coin-collection game, of course, and the loot you pile up goes toward purchases of power-ups like shields and speed boosts to help you get further in your next sortie. One novel thing it does is drag out the "Rainbow Birds" whenever you land seven consecutive big jumps out of the water (you'll know you've stuck one when your tail drags a colored or rainbow trail and a fish icon flies to the top of the screen). 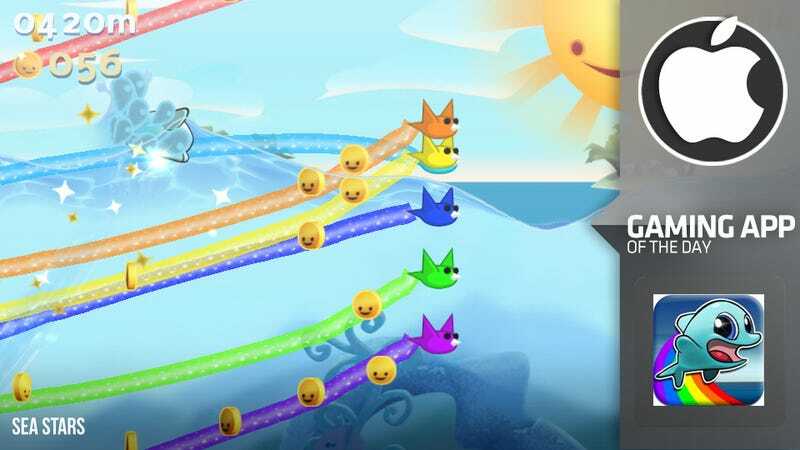 When you get the Rainbow Birds, all hazards ahead of you are cleared for a certain stretch of time and seven birds appear on the screen, trailing a ton of free coins for you to scarf up. At the beginning of a game, I was able to trigger consecutive Rainbow Birds appearances without much problem, but then the game seems to sense what you are doing and send more complicated jellyfish traps your way. Like defense in basketball, the game has you at your most helpless when it figures out a way to get you in the air—although it does allow you to defy physics and tap/hold the screen to drop out of a jump as swiftly as if you were plunging and surfacing on the other side of the water. The "Sea Stars" are friends that somewhat mimic the powerups from aforesaid Jetpack. Pick them up and you acquire a different means of screen navigation, plus a one-hit shield. Squinky the Squid, for example, turns your method of travel into a true jetpack, squirting out ink that sends you airborne when you tap the screen. Scuttles the Crab makes you crawl along the sea floor, jumping with each tap like a traditional platformer. A bird friend offers another variant. The coins you rack up may be put toward power-ups or new character skins, and the game somewhat cynically conditions you to this purchase habit by including a visit to its store in the initial tutorial. Of course you can add gobs of coins with an in-app purchase ranging from 99 cents to $50. But I found that playing the game the old-fashioned way provided enough of a repeatable and enjoyable challenge on its own. I didn't really feel like Sea Stars was hamstringing its free experience in order to make you buy a bunch of crap to play longer. Case in point, after an unrelated sync issue on my iPhone I deleted and redownloaded the game, then ripped off my longest run ever on it, more than 2,000 meters. That lasted at least two minutes, which is a great pick-up-and-play length that still invites you back. There are also plenty of basic powerups you may acquire in-game, which can be triggered after you bring out the Rainbow Fish, further incentivizing you to make them appear. Of course, you can visit the virtual store at any point; doing so in the middle of a run pauses the game. Sea Stars may not be completely original but it isn't poorly done, and there's plenty of play and replay value in its basic experience, especially through its escalating achievement system that delivers decent coin bonuses. Plus the game is available for free through the end of today on the iTunes App Store, so you can pick it up and legitimately get something for nothing. The constant conditioning to visit its coin store is a little obnoxious, but still easily ignored if all you want is a good endless-run game to kill time in a waiting room or on a long flight.